This is from a walk that I took yesterday at Lynch Park here in Beverly, MA. The park is surrounded by water on three sides. 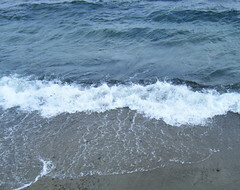 I took this photo looking down at the beach, from the the side of the park that looks out towards the Atlantic Ocean. It was windy, the tide was high, and the waves were strong. Tonight I cropped this image out of one of the photos. Yesterday I posted the latest photo of the collage and decoupage project I have been working on, a heart-shaped box that I am covering with printed metallic ribbons. This is a closeup of the inside of the box, which is going to be covered in pieces of red ribbon. Each little area of this project is a tiny composition, a miniature collage. 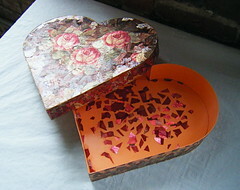 This morning, I went to the studio to work on this project, a heart-shaped box that I am covering with decoupage and collage created from printed metallic ribbons. During Open Studios, back in early December, I cut some ribbon pieces and put them in the box whenever I had a few quiet moments between visitors. (There was no chance to glue them down.) Well, cutting is faster than pasting, and so I am still working on pasting all of those pieces. 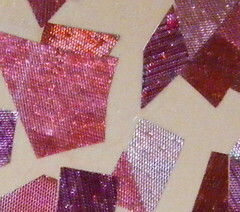 Almost all the pieces were cut from a pattern printed in red and gold. I have been concentrating on the gold pieces, for the outside. But as I trim out the gold from the red, I have also been keeping the red pieces for the inside. Today I made some progress on the gold areas, but also started pasting in the red pieces, and I was surprised at how much I had accomplished! So I decided to take a photo from above, even though the inside of the box is far from ready for prime time. 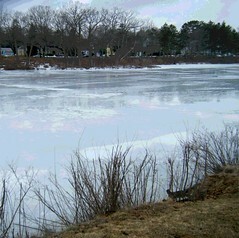 This is another version of my photo of the ice on the Cummings Center Pond. I used my Painter program to transform the photo into a digital woodcut. I think I like this version the best of the three because it emphasizes the lines of the grass and the horizontal surface of the ice. Yesterday I posted a photo of ice on the Cummings Center Pond, here in Beverly, MA. This is a version of the same image, but I used my Painter program to do some posterizing and to add some color overlays. I also created a digital woodcut of the same image, which I plan to post tomorrow. Tonight I cropped this image out of a photo that I took recently at Cummings Center Pond here in Beverly, MA. It was a cold, windy day, not much snow left on the ground (we were between snow storms), but there was still some ice on the pond. I also used this image to make a posterized photo as well as a digital woodcut. I will post them over the next few days. It has been overcast and gloomy all day; it started raining a few hours ago, and snow is expected any minute. So I think this calls for more flowers. 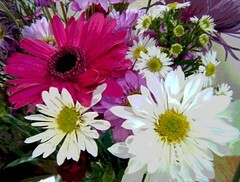 Here is another image, cropped from pictures I took yesterday of a bouquet at my daughter's. I posterized the image with my Painter program to add a little magic. 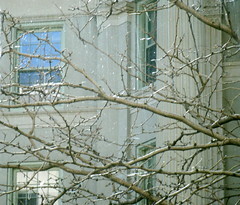 It is hard to wait for spring, with ice and snow still on the ground. Here north of Boston, we get a few days above freezing, and then another cold snap. I always love to look at flowers, but especially around this time of year. 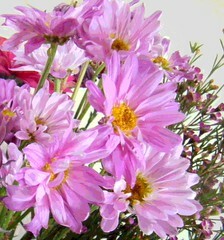 Yesterday I saw a bouquet at my daughter's, so I took some pictures. Tonight I cropped this image out of one of the photos. I opened the image in Painter and used digital pastel to fix up some some daisy petals that were being pushed out of place by a more assertive flower, and then I posterized the image. These aren't really spring flowers, but this image of store-bought flowers is a hopeful reminder that time is passing, the earth is turning, the seasons are changing, and spring is inevitable. 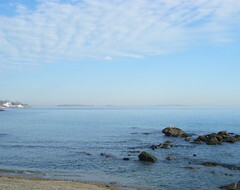 I took this picture today during a walk at Dane Street Beach today, here in Beverly. We had about two inches of snow last night, not too bad, but the wind at the beach made it feel extremely cold, so it was a very short walk. (The dog was disappointed.) But I took a couple of quick pictures because I liked the contrasting colors and textures of the sky, water, snow, and path. Tonight I cropped the original photo to get this composition. Yesterday I finally made it back to the studio! It's been a while since I worked on this project. (I checked: the last post was December 27!) What kept me away? Well, the usual snowstorms and crazy work deadlines of course, but most of all, the full month I spent coughing my head off (an evil cold that got my asthma started). So I stayed away from my studio to avoid dust and fumes. But yesterday, I was very glad to get back to my sunny little studio and this project. 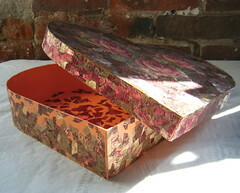 The heart-shaped box originally contained a Mother's Day gift from my daughter, and I am covering it with collage and decoupage made from printed metallic ribbons. Yesterday I worked on the outside of the box, the gold area, and concentrated on pasting in pieces I had already cut out back in December. I filled in some areas and closed a few gaps. I made a little progress I guess, but the real accomplishment was getting there in the first place! I used my Painter program to create this posterized version of the photo that I posted here yesterday, of a sunlit evergreen tree at Long Hill Gardens, here in Beverly, MA. I posterized this because I think it brings out the texture of the needles, and the contrast of light and dark. This image began with today's afternoon walk at Long Hill Gardens. I was looking for signs of spring, but of course, there is still plenty of snow and ice on the ground, despite some recent melting. So I decided to look up! I liked the way the February sun was hitting an evergreen tree, so I took a picture. 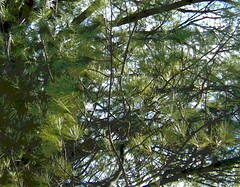 Tonight I had to crop in close to get the play of afternoon light on the pine needles, which is what I was after. I also created a posterized version of this image, and plan to post it tomorrow. Earlier today at my daughter's, I saw some little daffodils growing in a clay pot. I thought about taking a photograph, but got distracted and forgot to take a picture. Well, I think of daffodils as the first sign of spring, and here, north of Boston, we get this first glimpse of spring when daffodils appear indoors, because it is still very cold outside. (The crop of bunches of indoor daffodils seems to arrive in the grocery stores about the same time as the annual delivery of Girl Scout Cookies!) 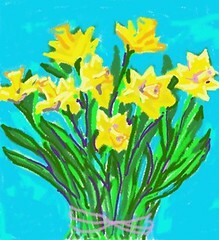 Well, I have been thinking of daffodils all day, so tonight I started to sketch daffodils on the computer, using Painter's digital pastel. I worked from memory and imagination, creating a bunch of cut daffodils rather than potted ones. But I wasn't sure I had the leaf shape right, so I did a quick search of daffodil images on Google to confirm, and then left the page of search results open as a general reference as I finished up the sketch. This was a good drawing exercise, and I had lots of fun sketching these digital daffodils. Here is one more image from my trip into Boston last Monday. I was in the passenger seat, and I took this picture from Storrow Drive. As we got closer to the Back Bay, I was trying to take a picture of the two most famous buildings from the Boston skyline, the John Hancock Building and the Prudential Center (AKA the Pru). I also captured a bridge, some parked cars, a yield sign, and traffic on Storrow Drive. Tonight I straightened the image, and then seriously considered cropping it radically to leave only the John Hancock Building and some trees. But I decided that I like the streetscape as it is. Even the marks created by the streaks in the windshield seemed to add something to the composition. So instead of cropping all of that out, I used Painter to create a digital woodcut from the image. The result is less than lyrical, but it communicates the feeling of heading into Boston by car. Today I had an afternoon out at Northshore Mall with my daughter. I thought it might be hectic and crowded, what with last minute shoppers for Valentine's Day and bargain hunters for President's Day Sales. But it was great fun and I had a lovely time! 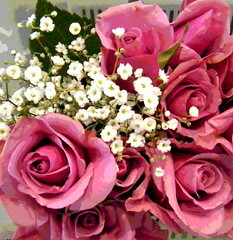 There were carts set up in the middle of the mall with big plastic bins full of roses for sale. I took a couple of quick pictures with my digital camera. Tonight I cropped this image from one of the photos, and used Painter to posterize it. Here is one last version of the photo from Monday's trip into Boston. I took the original photo while admiring the view from a window at the Starbuck's opposite Children's Hospital. Last night I used Painter to transform the photo into a digital woodcut. The colors are more sublt in this version, but the woodcut effect emphasizes the lines of the branches. Tonight I used my Painter program to posterize the photo that I published here on Monday, a view through the window at a Starbucks in Boston, across from Boston's Children's Hospital. I also created a digital woodcut of the same photo, and I plan to post it here tomorrow. This is another image from Monday's trip into Boston. 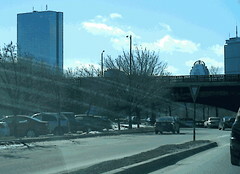 I was taking pictures (from the passenger's seat) as we drove down Storrow Drive, heading towards the Fenway. The traffic was stop and go, but to me that means photo ops. 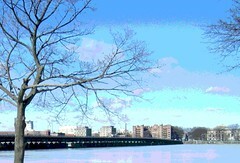 I had a nice view of the Charles River, still covered with ice, and the Mass Street Bridge. Across the river, you can see Cambridge, and MIT. Tonight I cropped the original photograph and used Painter to posterized it. I also used some color overlays to eliminate some distracting highlights in the clouds. I like clouds and I am in favor of highlights, but they were in the wrong place because I wanted to emphasize the reflective surface of the river, the cityscape on the river bank, and the long diagonal line of the bridge. For yesterday's trip into Boston, I had the passenger's seat for both the drive in and the drive home, so I had the luxury of taking lots of pictures. As always, I tried to photograph the Zakim Bridge. Tonight I cropped this image from one of the best of the photos. I took this picture today during a trip to Boston. I was drinking a Chai latte at Starbucks and noticed the view through a high window, so I took a picture. 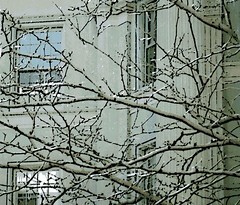 I liked the contrast of tree branches against the building. I checked to find out what building this was, and it is the Boston Children's Hospital. Tonight I cropped the image to get this composition. It's a nice souvenir of the day. Here is another photo from a recent walk at Lynch Park here in Beverly, MA. (In fact, this was taken on February 2nd, Ground Hog Day). 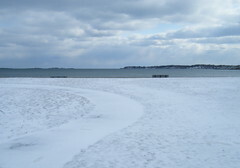 In this picture, I was interested in the park benches, inviting passersby to sit down, watch the ocean, and wait for spring. 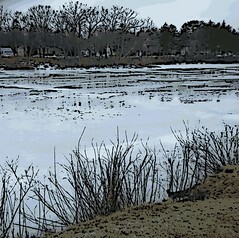 I used my Painter program to posterize the photo that I published here yesterday, a snow scene at Cummings Center Pond. I took the photo through the windshield of my car. I took this photo earlier in the week. 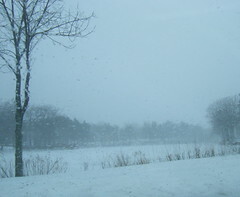 The vantage point was from inside my car, looking out at the Cummings Center Pond on a snowy day in early February. I liked the snow scene, and thought I might get some interesting effects from the precipitation on the windshield. Tonight I cropped the image to get this composition. This is another photograph that I took during this week's outing to Lynch Park, here in Beverly, MA. The February light was amazing! 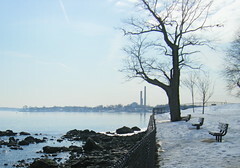 This is a view looking over the water in the direction of Salem, Salem Willows, and Marblehead. 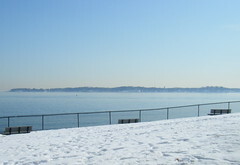 Tonight I cropped this image to emphasize the contrasts of park benches, white snow, and blue ocean. I also wanted to focus on the interplay of the diagonal and horizontal lines. This is cropped from a photograph that I took earlier in the week at Lynch Park here in Beverly, MA. There was still snow on the ground, but it was a bit warmer than usual, warm enough for a little lunchtime walk with the dog. When we got to the beach at Lynch Park, I thought the light was amazing, so I got out the camera. I was interested in the diffuse light near the horizon, the colors of the water, and the pattern of the clouds in the sky. 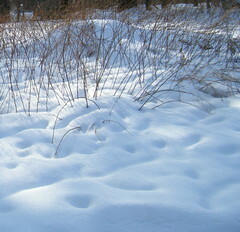 Two days ago, I posted a photographic image of snow and grasses, cropped from a picture I took at Long Hill Gardens, here in Beverly, during a recent walk. 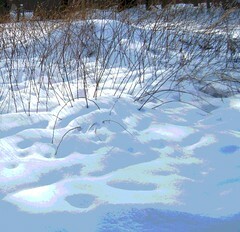 At the time, I was admiring the lines of the grasses against the snow. I decided to see what the photo would look like as a digital woodcut, so I used Painter to create this image. Like everyone else, I complain about winter, the cold, the leafless trees; but if it weren't for winter, it would be easy to overlook the lines of the bare branches, and the simple lines of the grasses against the snow. 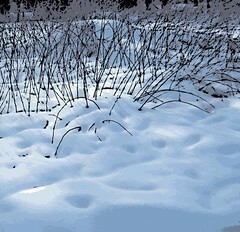 I used Painter to create this posterized version of the photo from yesterday's post, an image of grasses against the snow. I took the photo during a walk at Long Hill Gardens here in Beverly. I liked the contrasting textures and the way the light was playing on the snow. I also created a digital woodcut of this image and will post it here tomorrow. The weather was in the thirties today, so we took a walk at Long Hill Gardens, here in Beverly. Two things caught my eye today: the contrast of the lines of the brambles against the white snow, and the patterns in the snow itself. I assume the indentations were created by melting snow beneath, or perhaps by recent freezing rain. In any case, I liked the look of it, so I took some pictures. Tonight I cropped this image out of one of the photos. I also created a posterized version, as well as a digital woodcut. I plan to post them here tomorrow and the day after tomorrow.